Existing schemes of ecumenical dialogue since the Cold War, when the Orthodox Church of the Moscow Patriarchate was considered to be the privileged interlocutor, should be rethought after the Constantinople's action. Such an opinion was expressed by His Beatitude Sviatoslav in an interview to the English edition of Vatican events "CRUX". "Until now the ecumenical dialogue between the Catholic Church and the Orthodox world was perceived through the prism of the "Ostpolitik" and through the relations between Moscow and the Vatican. Now it is necessary to rethink not only the way of conducting this dialogue, but also to update the very concept of ecumenical dialogue, given that there are other representatives of Orthodoxy," said His Beatitude Sviatoslav. "By this time, we, Catholics, often projected the purely Catholic church model onto the Orthodox world. There is no single Orthodoxy like a single Catholic Church. There are local Orthodox Churches. To consider one of these Churches as the exclusive spokesman of the Orthodox world is a big mistake. 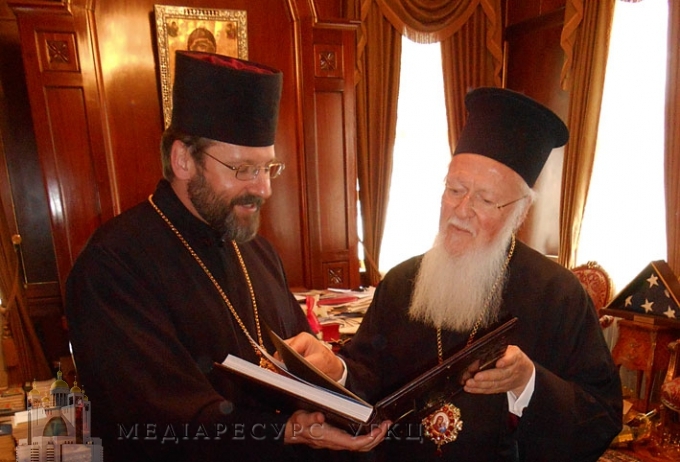 I think that the one who can truly be considered the first among the Orthodox Churches, according to the Orthodox canons, is the Patriarch of Constantinople, because he is the first among equals," stressed the Head of the UGCC. He also noted that the decision of Constantinople will start a new period in the history of the Universal Church. "It will be not easy, but interesting and, of course, inspired by the Holy Spirit," he added.